Introducing you today to – Beetroot Falafel that can be fried or baked.These Middle eastern street food is so loved across the world that it’s become a household name now. 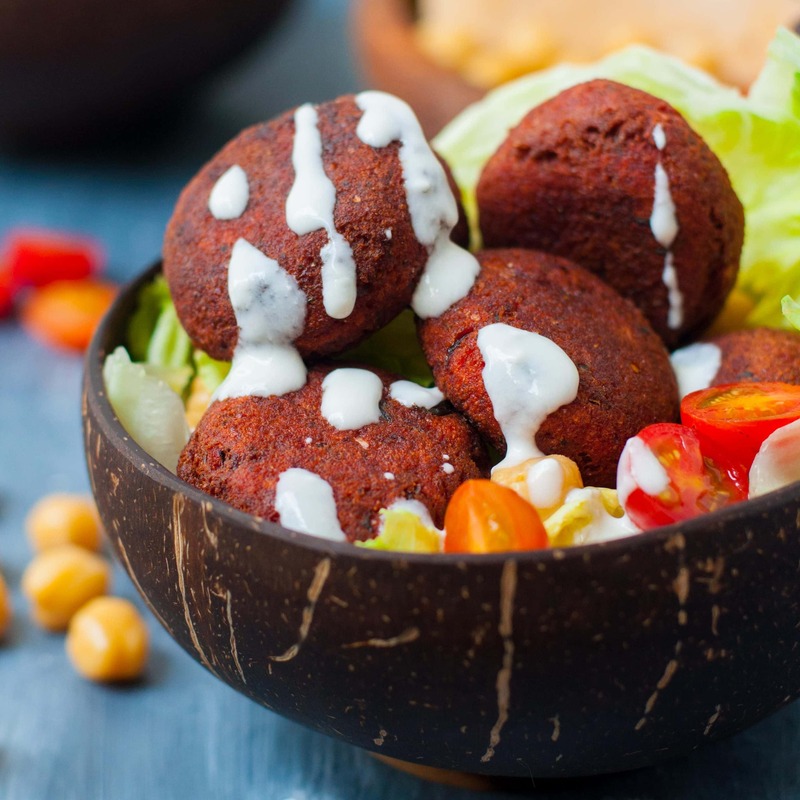 Easily made and even more easily eaten- Falafels or Felafel can be eaten simply with some yogurt dip or stuffed inside a pita bread with some raw veggies. Falafels are super high on nutrients because the majority of it is only chickpeas(garbanzo beans or chole) and veggies. In fact these beetroot falafels are not only vegan but also paleo and whole 30 approved. Beetroot Falafel can be made paleo and whole 30 approved by swapping flour with tapioca flour or potato starch and baking them instead of frying them. For a healthier option, bake your falafels instead of frying them. Baking Falafel is a great alternative when you don’t want to eat too much fat or are on a diet and want to enjoy food like falafels and fries.While baking, make sure the temperature is high -190 degrees Centrigrade.Usually falafels tend to be a bit dry and crumbly when baked in oven but the extra moisture from the beetroot helps them remain soft. Although, it cannot be denied that frying gives a better texture than baking.Frying also takes very little time as compared to baking. Servings: 20 depending on the size. Soak the chickpeas overnight (atleast 6 hours). Cook the beetroot- either by baking them in the oven at 180 degrees for 30-40 minutes or by boiling them in water. Remove the water completely from both the beetroot(if boiling) and the chickpeas. In a blender- blend together the beetroot and the chickpeas till they are a coarse mixture.Add water if required to aid the processing. Take the mixture out in a bowl.Add the flour, chopped garlic, onion,coriander and salt.Mix it with your hand. Roll it into small ping pong sized balls and refrigerate. Or brush them with a little bit of oil & bake them for 20-25 minutes at 190 degrees - flip them over midway.